Cakespy: Which came first: the treats or the truck? 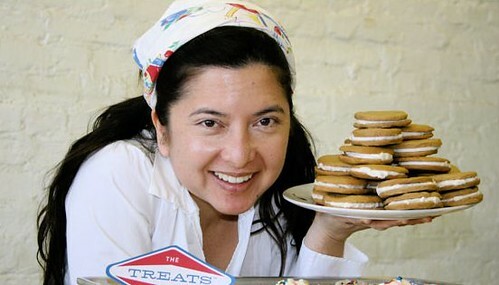 Kim Ima: The treats! I was obsessed with making treats, but as soon as I thought up the idea of the Treats Truck, that was it. I was instantly in love. CS: What was the first baked good you ever sold on the truck? KI: Hmmm, I know I had frosted Sugar dots (picture below), Chocolate chippers, oatmeal cookies and brownies on the truck that first day. I don't remember what was the very first cookie sold off of the truck. Aw, I wish I remembered! 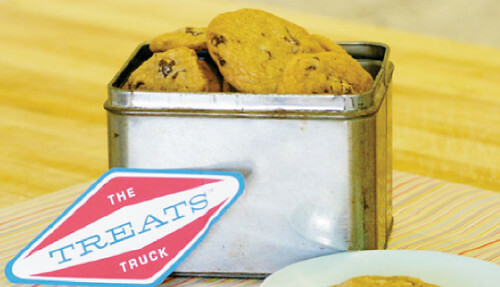 CS: Does the treats truck play music to attract customers? If so, what kind of music? Or, if not, what music do you listen to inside of the truck? KI: The truck does not play music. Most of the time, the streets provide the background soundtrack for the day. Oh, occasionally I park near a guy who plays the keyboard and sings Frank Sinatra. CS: Please finish this thought for us: An ice cream truck pulls up next to the Treats Truck at a red light, and revs its engine. What happens when the light turns green? KI: I nod at the driver, we lock eyes in a meaningful way, he looks my truck up and down, nods back, shrugs and speeds away. A note, "speeds away" for an ice cream truck is probably going 25 miles an hour. Cakespy Note: We just know that Ice Cream Man's quaking like Jell-o in his boots. CS: Do you think that one day the cultural icon of the ice cream truck may be unsettled by the concept of a treats truck? KI: I think we'll have both. Don't you think? CS: Your ice cream cone cupcakes have been getting a lot of interest lately. Why do you think they're so popular? KI: Well, they make people smile! 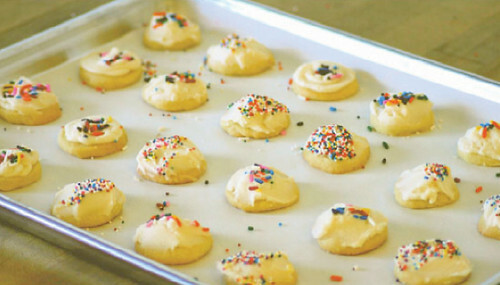 I know I love them because they are yummy and fun and have lots of icing and sprinkles. 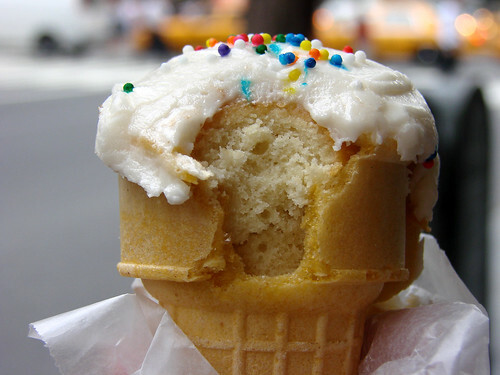 A cupcake in a cone? It is a special treat, no two ways about it. CS: Not only are you the proprietress of Treats Truck, but you're also an actress and artist. This begs the question--how do you do it all? KI: Well, there are only so many hours in the day, but the idea is that there will be many days ahead. Right now, I am working full time running the Treats Truck. In the earlier stages of the business, I did both. In the future, I will be able to return to working on projects in the theater. Right now, the treats need my full attention, and I love it. 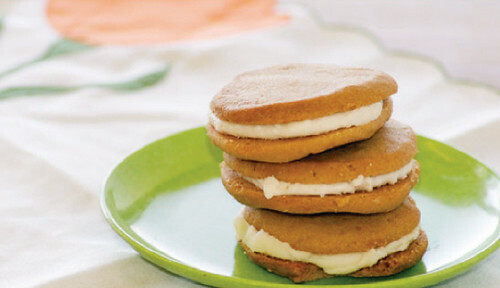 CS: You reference the "kitchen sink" crispy and cookie on your list of favorite treats. We've never had kitchen sink cookies. Can you explain the "kitchen sink" aspect to us? KI: "Kitchen sink" to me means you can put lots of crazy ingredients together. In a way, it is the idea of opening your cupboard and seeing what you can throw in. If I feature a "kitchen sink" crispy or cookie, I may put a mix of candy, pretzels and cereal in the mix. The next time it could change. It is a license to play. 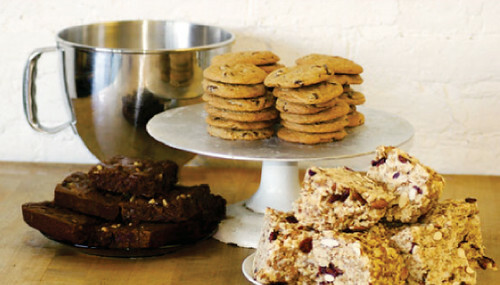 CS: Are some baked goods more popular in some neighborhoods than others? KI: Yes, as a matter of fact! Some neighborhoods love anything with peanut butter (especially midtown) and one neighborhood in Brooklyn really goes for crispy squares with whole wheat cereal and fruit in it and anything with jam. I bake more of certain items depending on where I'm going. It's fun to try out new specials on the different neighborhoods and see who is especially into them. 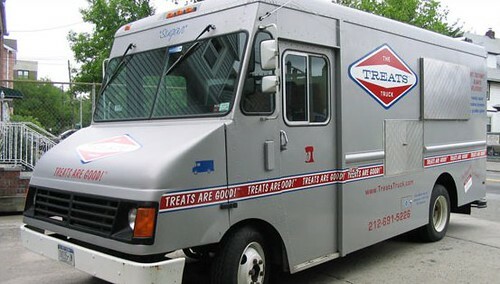 CS: What's next for The Treats Truck? KI: I would love to have two trucks with regular street schedules by the spring, as well as appearances at special events, and I would like to open a store in the next year or two. Are you in NYC? 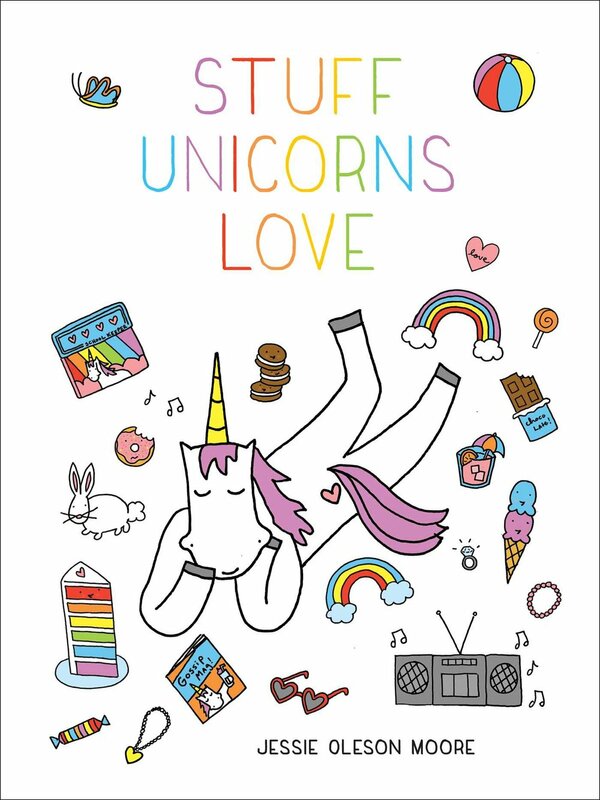 Check out their schedule here and start being a Treats Truck groupie today! Not in NYC? Admire them from afar (and coming soon, buy a t-shirt!) at treatstruck.com.